3. The best of the best president council award. 1. Los Angeles Chinatown Lions Club, first vice-president, 1992. 2. Chinese Business Association, Director, 1995. 3. 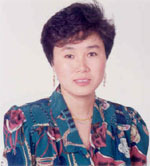 Chinese Business Association, vice-president, 1996.